Do we now live in Christ's Kingdom? 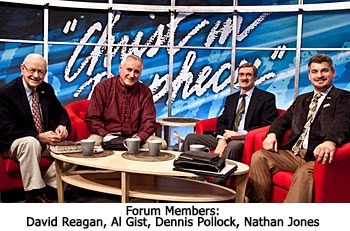 To answer that question, Dr. David Reagan and I on our television program Christ in Prophecy put together a panel of Bible prophecy experts. We invited Al Gist of the Bible prophecy ministry Maranatha Evangelistic Ministries from Louisiana and Dennis Pollock of Spirit of Grace Ministries which focuses on evangelizing the continent of Africa. Dr. Reagan: The Amillennial viewpoint was not the view of the early Church Fathers. All the records indicate all these men were Pre-Millennial, in that they believed in a literal thousand year reign of Jesus Christ on this earth. Amillennialism was developed by the fellow who became the greatest Church Father in terms of the impact of theology. That was St. Augustine. He taught a spiritualized interpretation of the Bible in the 5th Century around 400 AD when he wrote the book The City of God. The ideology was immediately adopted by the Church because basically what it's saying is that the Kingdom Promise that Jesus made to the Jewish people had now been transferred to the Church. The Church is the Kingdom, and the Church is reigning over the world today. Since Augustine's spiritualization of the Church as Israel became the position of the Church from then on. He believed we Christians are the ones who should have the authority, he argued, because we are the Kingdom of God on earth. That's the reason it was adopted so quickly. Once it was adopted during the Middle Ages, if you took another position you were burned at the stake, so people kept their mouth shut and they didn't talk about any other position. Remember, too, that the Bible was not available to people until the last few hundred years. There were no printed Bibles throughout most of Church History, and most people, if they had one, couldn't read it anyway because they couldn't read. So, people didn't know what the Bible said about the Millennial Kingdom other than what the Church taught. That's why for thousands of years Augustine's teachings have remained the dominate viewpoint of the Church. Dennis Pollock: True, as every time the people who could read the Bible came across these passages in the Old Testament which speak about the exaltation of Israel and how God would reign among them, they would just immediately transfer Israel's promises to the Church. Dr. Reagan: If you go back and look at a 1611 King James translation of the Bible, you will find in the Old Testament that the chapter headings which the translators put in there say, "God's Comfort to the Church." Then you start reading and it says, "Comfort ye Israel, comfort ye Israel." But, the King James translators put chapter headings in that made all these references to Israel refer to the Church instead of to Israel. Nathan Jones: There's an argument that can be made for the Amillennial viewpoint, that is that we are in the spiritual kingdom of Christ. Christ, when He died on the cross, ushered in His kingdom, which is a spiritual kingdom, to those faithful who would come out of this world and serve Christ one day. But, that doesn't mean that there's not a literal, physical kingdom that the Bible also promises. The physical Kingdom on this earth remains still in the future. Dr. Reagan: That's a very good point. It reminds me of the fact that when Jesus was ready to ascend into Heaven, His disciples asked Him, "Are you going to create the kingdom now? Is this the time?" He didn't say, "Hey, there's not going to be any kingdom." No. He said, "It's not for you to know the times." Al Gist: The state of affairs during those early centuries of this millennial really lent support to the idea that the Church was supposed to be the recipient of all these promises made to Israel. Remember when Christianity first started? It was just a sect of Judaism, a minority sect, that was severely persecuted by the Jewish leaders. Gradually, as the Gospel spread into the Gentile nations and the Church became much more populous which of course later on led to half of the Roman Empire adopting the religion of Christianity as the official State Church, at the same time Christianity was growing and becoming so great, the Jews were being oppressed. They were destroyed as a nation and the Temple was burnt down and they were scattered around the world. So, the logical conclusion is evidently God's through with the Jews and now the Church is the new spiritual Israel, and thus the recipient of all of those promises that God made to Israel. So, there were some things happening in history that kind of lent support to this idea of the Church replacing Israel. Of course, it's not biblical, but again, people tend to watch newspapers more then they watch the Bible. Dr. Reagan: In Zechariah 14:9, Jesus says that He's going to become king over all the earth. I went to my pastor one time as a kid and I said, "You teach that Jesus is never going to put His feet on this earth again. What about Zechariah 14?" And he read it, and he read it, and he read it. Finally, he turned to me and said, "Son, I'll tell you one thing, I don't know what this means, but it don't mean what it says." That kind of stubborn thinking is really the problem with adherents to Amillennialism. My rule of interpretation from beginning to end, and it doesn't matter if it's just prophecy or whatever is this: "If the plain sense makes sense, don't look for any other sense, or you'll end up with nonsense." You don't have to have a degree in hermeneutics. You have to have a Ph.D. in imagination. You just need to take the plain sense meaning of God's Word. Al Gist: Also, you've got to have a desire to study the Word and apply it yourself. Apply yourself to the Word and let the Word be applied to yourself and then you'll understand what God is saying. Dr. Reagan: Any final comments? Nathan Jones: I would like to bring up one little point that everybody probably knows, and that is at the end of the Millennial Kingdom the world will see one final rebellion. There will be one last terrible time coming to the world at the end of the Millennial Kingdom when a large number of those born during those centuries will turn against Christ and towards the recently released Satan, but Jesus will win over them as well. After that, the world will never again know war. Dr. Reagan: Amen. And in the meantime I'm just going to shout, "Maranatha, come quickly, Lord Jesus!"